Click the image above to read about what we accomplished last year. Function as the regional resource to hospitals and medical control authorities in the region. Coordinate efforts to develop a comprehensive all-hazards medical preparedness plan and update and enhance the plan as new strategies are developed. A) Coordinate regional needs assessment; B) Coordinate regional response plan. Coordinate efforts to upgrade hospital and pre-hospital surveillance and reporting. Efforts shall be coordinated with public health resources. Coordinate efforts to enhance the readiness of the hospital, pre-hospital and medical systems to deal with large numbers of casualties and patient surge. 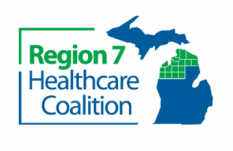 Coordinate efforts to expand communication and emergency response capabilities between hospitals, medical control authorities, emergency medical services, physician offices, rural centers, local and state law enforcement agencies, and the Michigan Department of Community Health. Coordinate efforts to enhance the medical system in the region for responding to a bioterrorism event or other emergency or disaster. Provide guidance to staff, private citizens, businesses, and other governmental units regarding bioterrorism events or other emergencies or disasters. Develop a regional medical preparedness plan that identifies personnel to be trained to receive and distribute critical stockpile items and manage a mass distribution of vaccine and/or antibiotics on a 24-hour-day, 7-day-a-week basis. Develop a plan to disseminate education to the health care organizations in regards to exposure risks and effective response. Assess and develop a training plan for emergency department personnel, infectious disease specialists, EMS personnel, public health staff, and other health care providers. Plan, organize, evaluate and conduct regional response drills that test the use of equipment, communications, personnel and the emergency preparedness plan. Evaluate drills and provide after action reports to appropriate agencies. Maintains relationships with local public health, emergency management, homeland security and others in the region involved in preparedness planning. 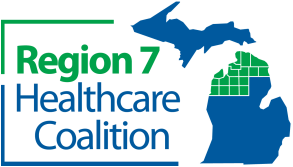 The 8 regional healthcare coalitions. Identify in which county your facility resides to determine your designated region. Each region has a Regional Coordinator that manages the ASPR cooperative agreement for healthcare preparedness activities. 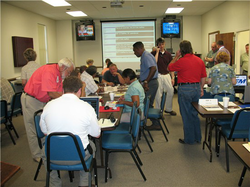 Each county has a local Emergency Manager who is responsible for assessing and measuring a local jurisdiction's capability to mitigate against, prepare for, respond to, and recover from emergency and disaster events. At each of the local public health departments, there is a full-time Emergency Preparedness Coordinator who manages the CDC cooperative agreement activities for their jurisdiction.